The first batch was less gingery than I like. I’ve doubled the amount of ginger I add per day to two teaspoons. I tried doubling it again to four, but the drink was more gingery but somehow less interesting, more like fizzy ginger than nice, tart ginger beer. So every day add two teaspoons of ginger and two teaspoons of sugar. I take 20 oz of ginger root – which is a lot, but it’s $2/lb around here – and cut it into smallish pieces. Then I drop it into boiling water for two minutes to scald it, to kill any surface bacteria. After that I blend it with a couple of cups of water until the ginger is blended very fine. Add four teaspoons of sugar on that first day, and then two teaspoons of sugar (no ginger) each day for the rest of the week. Since there’s no powdered ginger, the Ginger Beer Plant filters out much more cleanly at the end of the week, ready for splitting for the next batch. I have also cut the sugar I add down to 2 1/4 cups. 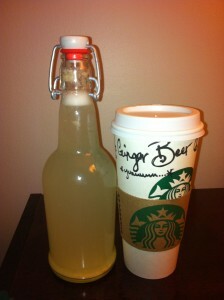 I tried it at 2 cups, but that ginger beer batch tasted very good but a little dry. 2 1/4 seems just sweet enough, to me. As I mentioned, I’m using about six cups of water or water + ginger juice in the fermentation jar, so I’ve cut the 18 cups of cold water to 16 in the bottling mix. I just bottled batch seven, and with the exception of the batch that I tried four teaspoons of ginger per day, they’ve all been excellent, and that one, while disappointing, was still quite good. 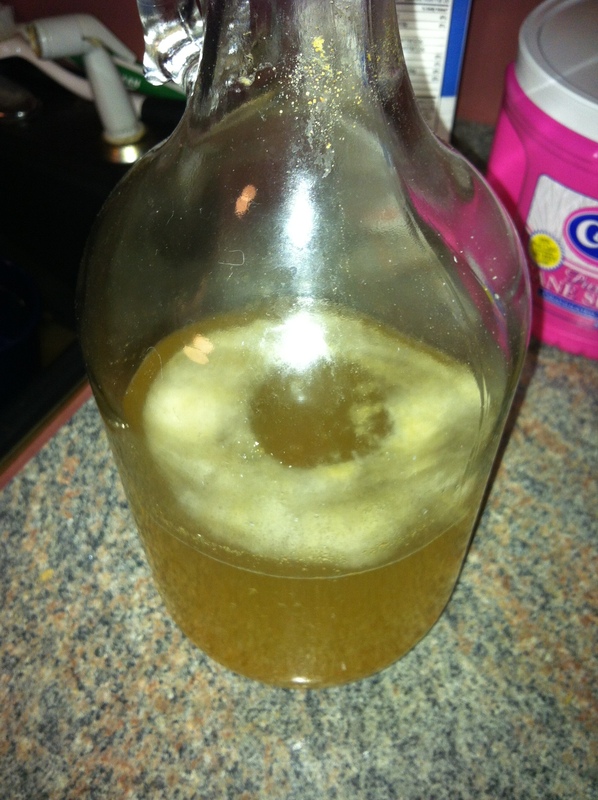 My mother used to make ginger beer. She got the recipe over fifty years ago, from – she believes – family friends the Goodsons, when we lived in Totton (near Southampton). I’ve tried many commercial ginger beers in England, none as good as what she made. Over here in the states, ginger beer is almost impossible to come by. American ginger ale is not the same thing at all. Last summer in England we discovered Fentiman’s ginger beer, which is Good Stuff. When we returned to Texas we found that World Market carries Fentiman’s, and we’re happy. But I still have a desire to make ginger beer like my mother used to. So I did some googling and learned that there’s a good-sized community of people who make ginger beer. 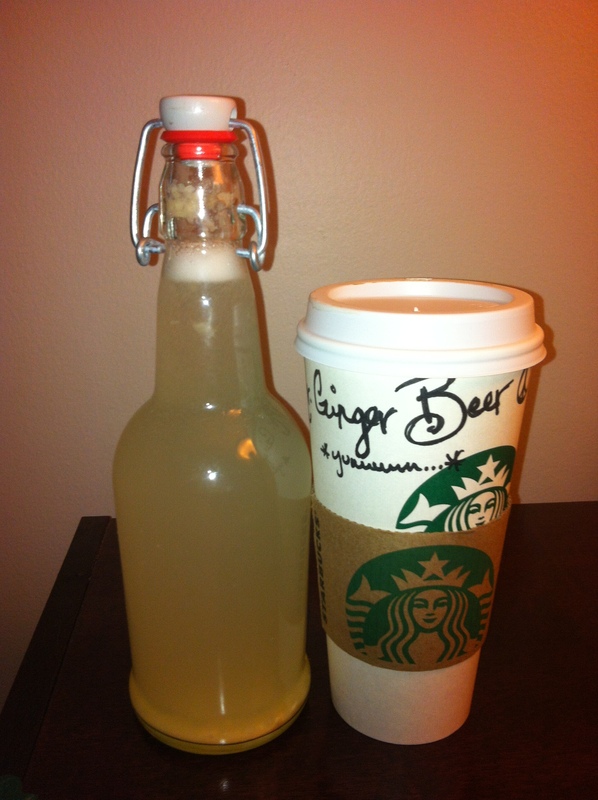 The biggest roadblock to getting started is that traditional ginger beer isn’t brewed from yeast. 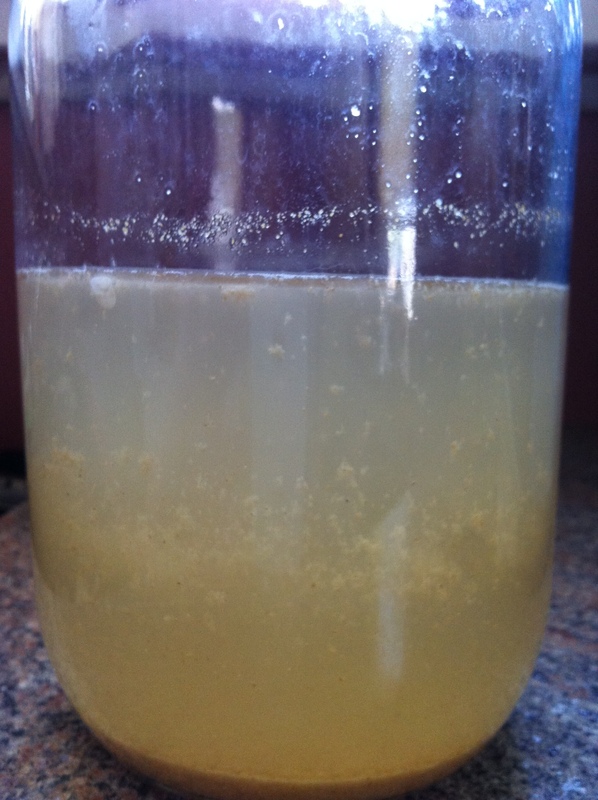 Ginger Beer Plant is a mix of a specific yeast and lactobacillus. The yeast produces alcohol; the bacteria turns some of the alcohol into lactic acid. People do brew ginger beer with brewing yeast, or by leaving ginger and sugar open to the air and picking up opportunistic yeasts, but traditional ginger beer requires obtaining Ginger Beer Plant from another ginger beer brewer. The plant has been around in its current form since at least the mid-19th century. My mother got hers from Mrs. Goodson way back when. Fortunately there ways to contact other brewers. I had no luck with commercial Ginger Beer Plant vendors; brewing has become more popular and it’s hard to keep stocks, apparently. There’s also a risk that the vendor will sell brewers’ yeast as Ginger Beer Plant. But there’s a Yahoo group dedicated to Ginger Beer Plant, with contacts and recipes. I contacted someone in England with starter plant, and received it just over a week ago. The recipes that I’ve found on the net don’t look much like my mother’s, so I called her. She still has the recipe, now with fifty years of crumples and tea stains, so it took a while to figure it out. I used it exactly as written, but I will probably tweak it some for the next time. Just starting, no fermentation yet. Fermentation progressing well after a couple of days. Every day for a week: feed the plant one level teaspoon dried ginger and two level teaspoons sugar. At the end of the week, swirl the jar to mix well, then strain through muslin, reserving both the strained liquid and the sediment in the muslin. In a 2+ gallon container, mix the liquid with 18 cups of water and the juice of three lemons (strained). Once you’ve finished bottling, put the muslin with the sediment in eight cups of water and swish all of the sediment into the water. Remove the muslin, swirl to mix, and divide the cloudy mix into two equal parts. Use one part as your plant for the next batch, throw the other half away or give it to a friend to make ginger beer. I only had twelve pint bottles. I pressed a SodaStream plastic bottle into service, and still had a large glass left over. I’m not sure how big the SodaStream bottle is, but I must have had about two pints left over. Using 26 cups of water should be 13 pints; I can’t imagine the lemon juice or dissolved sugar change the volume that much. Probably I didn’t fill the bottles full enough, and I’ll fill them to 1/2″ of the cap next time. Anyway, I drank some of the leftover liquid to see how it tasted. It reminds me a lot of the ginger beer my mother made, fragrant and delicate. But now that I’m hooked on Fentiman’s, I think I’d like my ginger beer to be stronger, so next time I’m going to double the amount of ginger I feed the plant every day – two level teaspoons each of ginger and sugar. Also I’ll cut the added water to 16 cups (plus 4 cups hot) instead of 18. I don’t trust Texas tap water, especially after reading about Naegleria occasionally being found in the water supply (apparently it doesn’t cause a problem if consumed, but can using a neti pot, where it can infect via the nose). I have no idea whether an amoeba would thrive in a fermenting liquid, but since it’s designed to keep a yeast and bacterium alive I don’t want to take the chance of brewing a colony of brain-eating amoebae. So I’ve used 100% filtered tap water. Closer to summer, of course, our water’s pretty undrinkable anyway, and using unfiltered tap water would taste terrible, so during summer I would definitely want to use filtered or bottled water, whether or not the local water supply can be trusted. Ginger Beer Plant is apparently quite robust, and is not likely to admit any other fermentation source, so it isn’t really necessary to brew ginger beer with a fermentation lock. A clean cloth cover is fine. Since my plant would be weakened by shipping, I decided to treat it as I would have treated a more sensitive yeast; I carefully sanitized everything I used and grew the plant in a fermentation jar with lock. Now that the plant is doing well I will probably not bother with sanitizer, I’ll just keep all of the bottles and bottling equipment clean. Update: I’ve found it as easy to continue with sanitizer as to clean the bottles, and it’s good to have some ready when I need to use an extra bowl or spoon that I hadn’t thought I’d need, so I’ll stick with it. I sanitize the bottles and all the equipment in the mixing bucket, then pour some of the sanitizer into a large pan when I’m done. I need some for the fermentation jar after it’s cleaned out, and the pan is big enough to soak anything else I need. I am very much looking forward to trying this batch. 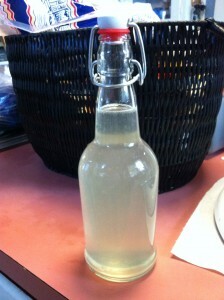 If you’re looking for a Ginger Beer Plant to start brewing, leave a comment. I’m keeping the extra GBP from the split after bottling and will be happy to share. 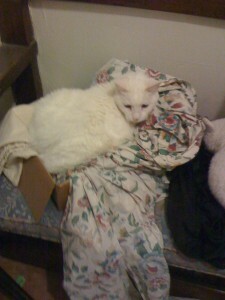 It has to be at least a year since Snowflake (Woidat) took up residence in the dining room. In fact I think it’s over two, since I’m pretty sure she hasn’t been part of the feline family for as long as Parsley has been around. Until Saturday, when something strange happened. We’d already committed to taking her to the vet. She was suffering, and wasn’t eating. On Thursday night I had managed to get her to eat a little Fancy Feast tuna – which probably wasn’t good for her, given the likely state of her kidneys, but it had to be better than not eating at all. Perhaps because of a little new-found energy, perhaps with the extra attention, or perhaps just wanting to let us know how ill she was feeling, on Saturday she crawled out of the dining room into the hallway. I was on the phone to my mother at the time, and I’d already had a hard time telling her what was going on. When I saw that Woidat had come out to see us for the first time in years, I just lost it. Whatever the reason for her coming out of her shell for the final day, we were pleased to be able to spend a little time with her. She curled up to sleep on a towel in the bathroom, and seemed reasonably content. Elliot came by and spent some time with her on Saturday – of course she’s been part of the family since he was eight. I only felt her shiver, Vicki says she purred for her. The trip to the vet on Sunday was as painful as we expected. It’s hard to say that you don’t want them to run tests and maybe see if she can be treated, but all that would have bought would be some small relief for us. For the cat it would be more indignities and at the best, longer to suffer. So yesterday afternoon I laid her to rest in the yard, beside Pepper and Boober, her sometime nemeses. I still find myself surprised that a cat who has always somewhat set herself apart, especially recently, has affected us all so deeply in her passing. But we were happy to give her a home for the last seventeen years, and I will never regret taking her in. It’s that time again. We’re about to lose another cat, and as always it’s heartbreaking. Snowflake (aka “Woidat”) was a stray on the campus at Kodak in Richardson where Vicki was working. She was in pretty bad condition, and terrified of people. Vicki told me that she was going to try to catch the stray. I was annoyed. It wasn’t up to us to rescue every stray animal in the city. But she caught her and brought her home, intending to clean her up and give her away, but when I saw her I couldn’t let her go. She was bedraggled and scared, but she was such a pretty cat and so clearly gentle that we decided she had to stay. That was 1994, and even then she wasn’t a kitten. She was probably somewhere between two and four. So she has to be at least nineteen now. She must have been abused before we got her, and over a period of time. For years she’s snap if you tried to touch her belly. You could pick her up, but only if you were very careful. Her gentle nature didn’t extend to threats. She’d bite and scratch viciously if you tried to stroke her stomach, or if she felt cornered by the vet. She’d yowl loudly in warning first, and she’d yowl if she was nervous, even if she was purring and enjoying the attention otherwise. Back then we still had Mokey, Boober’s mother, and Mokey and Pepper, our first cat, had a constant turf war going on. Snowflake put a stop to that, and ruled the roost for a while. When we moved to McKinney, in 1995, she went crazy in the empty rooms and long hallway with hardwood floors. For days she’d run around the house, building up speed and sliding to a stop. 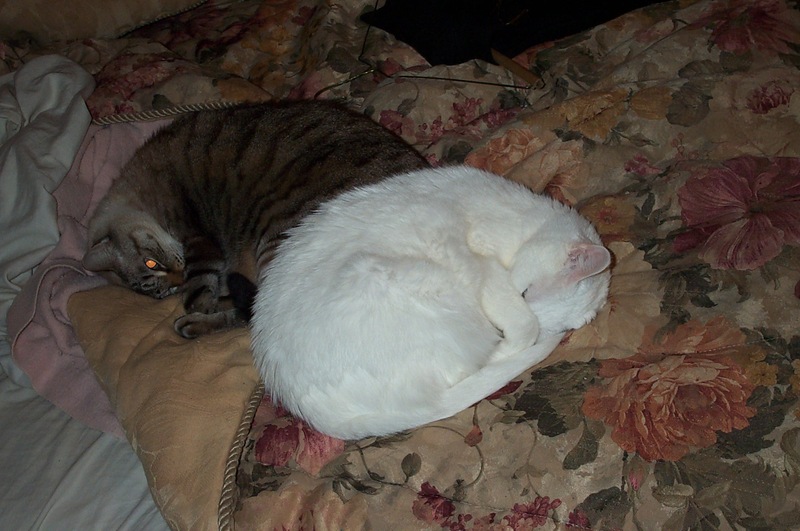 She and Pepper always made a show of hating each other, but Snowflake withdrew slightly after Pepper died. She and Boober got along reasonably well, and she tolerated Elliot’s cat Smokey most of the time. But Boober has gone, and Smokey is with Elliot, and she’s too old to manage change. She hated Lavender and Parsley from their arrival as kittens – with good reason, because they each terrorized her. For the last couple of years she hasn’t moved from the dining room, and we keep the other two cats out of there. I’ve known since she claimed the dining room that she wouldn’t be with us much longer. When Boober grew old, I always knew that I’d be miserable when he died. With Snowflake I didn’t think it would be so bad, for two reasons. Partly that she has pretty much cut herself off from us for the last couple of years, so we haven’t been close to her, and partly that I’ve always felt that however long she was with us, it was so much better than what she had been through that I could only be happy for her. But I guess that was pretty stupid thinking. When a cat has been with you seventeen years, even if she has become an irascible old cow, she’s still part of the family. When we returned from England three weeks ago, I was worried about what Lavender and Parsley would have gotten up to, but it was Woidat’s condition that upset me. Over the three weeks she’d aged, and her eyes had become sunken. A few weeks before we left, Vicki had Snowflake’s fur shaved, because she hadn’t been able to look after herself and it had become very matted. When we returned, it felt clammy, and she was quiet, for the first time in seventeen years. She did improve a little, she yowled occasionally if there was someone around, but today Simon told me that she seemed to have stopped eating. I know what that means, having been through it a few times now. We could maybe find something to get her appetite back temporarily, but it would only buy a few days. Her kidneys are probably not functioning, and the best thing we can do for her is to take her to the vet one final time. Many years ago, when the web was in its infancy – I think this was in the days of Windows 3.1 and Trumpet Winsock – I stumbled upon a poem by Gavin Ewart. It upset me so much that I printed it out, because I knew I’d want to read it again, but didn’t want to bookmark it. It wasn’t something I wanted to encounter by accident. Back then Pepper would have been middle-aged. Even though I knew she had a few years left the poem reminded me that I’d be devastated when we did lose her. Now that time has come around again, and it’s time to acknowledge that our Woidat has seen her share of living summers, and far more than anyone would have forseen for the bedraggled, abused young cat Vicki brought home seventeen years ago. which must soon come â€“ as I cannot forget. Who the hell is Russell Brown? A few years ago I noticed I’d gotten email for Russell Brown at my email address. I figured it was just regular junk; I get more than enough misaddressed spam. But mail for Russell Brown (always addressed to RUSSELL BROWN in block caps) kept arriving, and I realized that it was all from travel companies. Again, if you’ve gotten added to a particular spam list you’ll soon be added to related ones. But these were from reputable companies. Holiday Inns. Princess Cruises. La Quinta. Not generally spammers. It seemed that Russell Brown (uh, I mean RUSSELL BROWN) was using my email address to subscribe to newsletters and such. Which I didn’t understand. There’s a Brown in my name, but there’s no Brown in my email address, so it’s hard to see how he could claim to have accidentally used Iain Brown’s email. More recently I’ve started receiving booking confirmations. RUSSELL BROWN is still using my email address for travel, but it isn’t just subscribing to websites now, it’s making reservations. And the way he consistently uses my email address convinces me that it’s deliberate. It’s not generally easy to register at a website with someone else’s email address. Unless you can log in to the mail account you can’t get confirmation numbers. Either none of these sites required confirmation, or he created the account using one address and then logged in and switched it later. Or maybe he’s selecting hotel companies based on whether he needs to provide a working email address. Maybe he doesn’t have an address. He can figure out how to create an account and make an online reservation, but he doesn’t understand Yahoo, Hotmail or Google. That might account for the all-caps name. Or else he doesn’t want his travel details known. Maybe Mrs. RUSSELL BROWN isn’t supposed to know about these overnighters at La Quinta. I just got email from PayPal about their privacy practices. The email rings all alarm bells for being a phishing attempt. If I didn’t have relatively safe command-line tools to evaluate it, I wouldn’t have touched it. In an era where all personal data is on the line, when anti-fraud companies are warning everyone to be very careful about trusting email, and especially to avoid clicking links, it’s stupid for a major company to encourage you to take risks. If I knew who to report this to, I would. But it isn’t phishing, it only masquerades as being phishing. The email is in html. One of the certain signs of spam is if you mouse over a link in email, and the mouseover text is different from the link. This one is. So if you click on the link, you don’t go to where the text says. Instead, it takes you to a redirector at email1.paypal.com. Had the redirector been anywhere else, I’d have known beyond any reasonable doubt that the mail was phishing. But for it to be within the paypal.com domain, a phisher would have had to take control of a paypal server, or find a vulnerability in one. Neither of which is out of the question, and it could be done to make the mail look more legitimate, but another option is that the sender is an idiot, so I decided to keep looking. The redirector at email1.paypal.com redirects to somewhere else, outside of the paypal.com domain. So now it looks like a spammer did take control of a paypal server to make the redirection look more legitimate. But then, following the redirection chain further did bring me back to PayPal; to the same place as the text version of the links. Also: the mail was sent to my primary PayPal email address. That’s one I don’t use anywhere. I don’t get spam on it. I’ve never seen spam there, while I get lots of PayPal phishing mail at my other addresses. – This is a legitimate mail that looks exactly like phishing email from a company that’s a prime target of phishing, which redirects through a shrouded external business for no apparent reason. I guess there could be a third option. Maybe this is PayPal sending out apparent phishing email to collect statistics on who is gullible enough to click through links they should clearly avoid. Looked at that way, maybe it isn’t so stupid after all. Something tells me this isn’t the right answer, though. I’m not sure if I’m ready to write this, but I want to try before I forget too much. I delayed my birthday this year to Saturday June 6th because my wife was out of town until then. When my fake birthday arrived, she presented me with a gift that was completely unexpected – a kitten. A beautiful little lynx-point Siamese. There were reasons beyond just the fact that I like cats and still miss our old storm cat that I’ll mention, but I had no idea she was going to do this. I almost spoiled the surprise, in fact. When Vicki and the kids go to the pet store for any reason they always spend a few minutes looking at the cats and kittens up for adoption. And we were out of cat litter, so I called her to ask her to pick some up, but what I said was “you need to make an urgent stop to look at kitties.” Meaning to go to the pet store, but she thought I was referring to the kitten she already with her in the car, and I heard stunned silence for a moment. Fortunately I explained myself before she asked how I knew what she was doing. 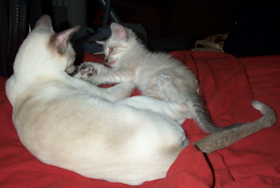 Simon has a female Siamese, and Vicki has always intended to breed her once; this is the additional motive for getting a male Siamese, and I recognized that, but it doesn’t detract from having my own kitten. She even promised not to steal him – she has a way with cats, and they all gravitate to her, but with the kitten (as with Simon’s Lavender) she promised to try not to take over. He was a skinny little thing. From a breeder, which isn’t how we’d usually acquire a cat, but pure Siamese don’t turn up in the rescued cages. He had piercing grey eyes and a gentle purr, and he took to me immediately. He would sit on my chest, sphinx-like rather than curled up, with all of his claws sinking into me. (Siamese claws aren’t fully retractable.) Occasionally he’d climb so high I couldn’t lower my head because he’d be wedged under my chin. I worried about him not eating or drinking. He seemed to be doing, because he’d use his litter tray (usually), but I rarely saw him eat, and when he went to the water bowl he’d splash his face a couple of times but not start lapping. I also worried about him interacting with Lavender. She hissed and spat at him for about two days, but then she started playing with him, and even mothered him, cleaning him up. He started following her around the house, and if I ever couldn’t find him, I’d just look for Lavender, because he would be close by. When I came home from work, Lavender would run to the door making her Siamese yowls, while the kitten would trail behind with high-pitched meeps. I still have text messages from that week in my phone where I was letting Vicki know how well he was doing. On Thursday morning I texted her that he had woken me up at 5:30, climbing up me (claws digging in securely) to perch on my arm. Later that day I texted her again that I’d seen him drinking from his water bowl. Elliot suggested the name Basil, and I thought about it for a while. Friday I had to stay home until a tech arrived for our air conditioner service. I ran a bath, but then the tech called and I didn’t have time to take it. Vicki got back into town, and I took the opportunity to get to work. During the day I decided that Elliot was right. The kitten’s name was Basil. Not Bay-zil, the English pronunciation, Bazzil, like Basil Fawlty or Basil the Rat (both from Fawlty Towers). As small as he was he was like a little rat, and Basil the Cat seemed perfect. She had to go into the office too, so we met quite late for dinner, and then I headed home while she and Simon stopped by the drug store. When I arrived home, it was quiet. After being greeted by both cats for several days in a row, that felt wrong. I called out, and Lavender answered from the bedroom, but there was no echoing meep. The bathroom door was open, and I knew what I was going to find before I went in. Basil – poor, tiny little Basil – was floating on the top of the water in the bath that I’d forgotten to empty. He was cold and already stiffening. When I picked him up and held him close the last breath from his tiny lungs made him meow. I had to call Vicki. I couldn’t stand the thought of what I’d done to that lovely little kitten. She and Simon were heartbroken, too. They hurried home, and when they saw his little bedraggled body they wailed as much as I was doing. I buried the kitten in our yard, alongside our old Pepper cat (the first cat we ever owned) and Boober. I spent a week bonding with that precious little kitten, and he died to my stupidity. I didn’t even get to use his name while he was alive, only saying goodbye to little Basil as I laid him to rest. The breeder was sympathetic enough to let us have Basil’s brother, although she was also upset by his loss. I wasn’t very fun company that weekend. Parsley, the new kitten, is much like Basil – which I’d hoped would be true. Getting to know him has helped dull the heartache. 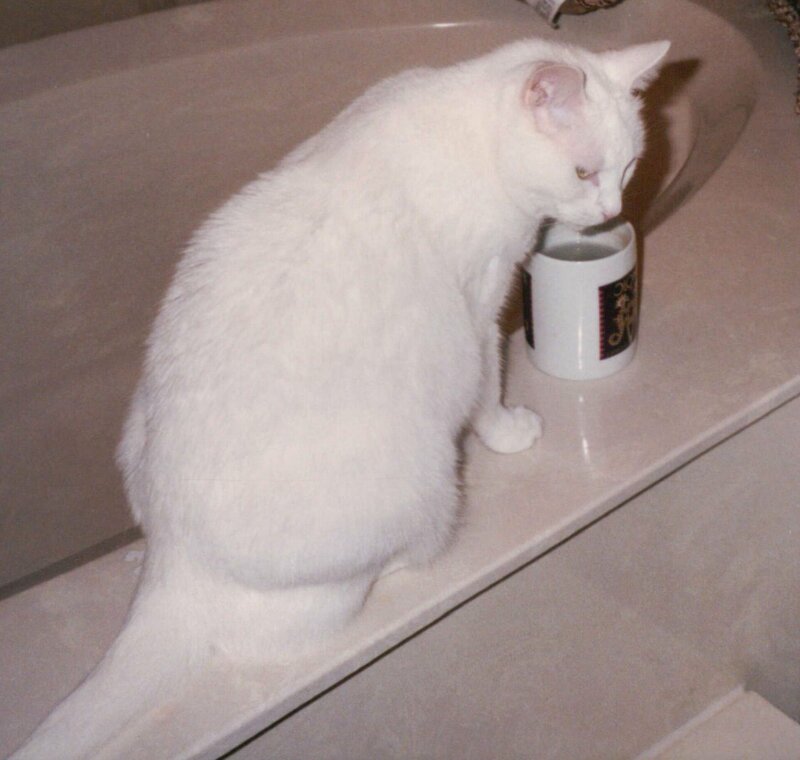 Sometimes a whole ten minutes passes now without me remembering the little limp body in the bathtub. He’ll be everything that Basil could have been. He’s maybe a little more adventurous, and a little more interested in people than in following Lavender around everywhere – but I don’t like to compare them. I feel that if I do I’ll be finding fault with Basil in some way. 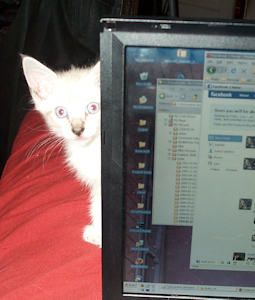 So while I’m glad to have the new kitten, Basil’s memory is compartmented, and I think I’ll always miss him. A taste of England – for a time. When I first came to the US, I didn’t consider that it would eventually become my home. After I took up residence here, I don’t think I ever quite believed it would be permanent. Even after I married, I think I assumed that sooner or later we’d move back to the UK. The more I realize that in reality I’m now here permanently, the more I miss the rest of my family, and understand that I’ve never come to terms with being 5,000 miles from them. That’s not what this entry is about, though. Apart from family and intangibles, like the Yorkshire countryside, or the sea being within driving distance, there isn’t much that I regret not having. What I do miss are some specific food items. Real bacon, not the thin, streaky, fatty stuff I can get in the grocery store, good as some of it is. Chocolate. Fish and chips. And most of all, milk. I’m from Hull, former fishing port, and still home to the largest concentration of fish and chip shops (with generally good fish). I think it’s probably harder for a Hull native to be deprived of fish and chips than most other Brits. But I’ve found that when I travel to England I can eat fish and chips a few times to satisfy the craving, and then ignore it for the rest of the vacation. Anyway, Kroger has started carrying Galaxy. Only small bars and Minstrels (chocolate-candy covered chocolates, like oversized M&Ms with the bitterness removed), but a few small bars is still cheaper than the postage for my mother to send me a large bar. So I no longer need to gripe about chocolates. Milk, though. That has been a problem since I first came here, 29 years ago. Some milk is better than others, but the best I can find tastes bland compared to regular cheap grocery milk on the other side of the pond. And that isn’t something my mother can send. And then a few months back, I was visiting Whole Foods in Plano, and I found milk from “Remember When Dairy.” I bought it by accident, in fact. Organic milk was very expensive, and the price of this milk was about half (but it turned out I was looking at the wrong price; it’s about the same as certified organic). Then, when I got it home I noticed it said “shake well,” and realized it was non-homogenized milk. I’ve always prefered non-homogenized; even when you shake it up, it’s creamier. Unfortunately, even in the UK it’s hard to find now. So I poured a glass and tried it – and it was every bit as good as the milk I grew up with. Better, even – the milk is from a Jersey herd. It’s organic, though not yet certified, so it can’t have the label, but it is. And much better than Whole Foods’s other organic products. The 2% milk is richer than any whole milk I’ve tried elsewhere. As expensive as it was, and as awkward as it was to get to the Plano store, I made the trip several times. Life was good. And then, a month or so after I discovered the milk, it started to vanish. I could get a couple of half-gallons occasionally, and then nothing at all. I’ve tried to find out what has happened, and where I can still get the milk. The Lakewood Whole Foods is supposed to carry it, but when I tried to get some there was one half-gallon of 2%. A recent Morning News said that Central Market carried it, but I’ve never seen any, and the CM manager told me they’ve been trying to carry it, but their sales volume would be too low. Now I have email from the Whole Foods store that may have more of the story. Apparently the dairy is currently out of business while they move from Texas to New Mexico, and they expect to resume shipments in 45 days. How believable that is, I don’t know. This was probably a very bad time to start a dairy, but if they’re really relocating rather than failing, and if they really plan to distribute the same products back to the DFW area, it doesn’t bother me whether or not they’re in Texas. I’m hopeful. I’ll know in a couple of months whether to cry over spilt milk. Edit: I forgot the main requirement of a Brit living in the US – a supply of decent tea. Fortunately that has never been very hard. I used to have to go to the Indian grocery for Typhoo or PG Tips. More recently, Central Market started carrying Yorkshire Tea (which is the best of all) and Kroger has PG Tips tea bags. … is one who promises to pay for a senate seat, but then welshes on the agreement. Apparently. Today’s not a very interesting news day. There’s very little to glean anywhere other than the inauguration of President Obama. It’s an historic event, that an African-American has reached the highest office in the free world. And it is, there’s no question about that. But I can’t help feeling that the intense focus on the fact that the president black is missing the far more important fact that he’s well-educated, thoughtful and capable. We don’t need a president of a particular color, we need a president who is insightful enough to understand problems, confident enough to solicit contrary opinions, and strong enough to implement solutions. From all accounts, Obama is all of these. What concerns me about the issue of race in this inauguration is that it is obscuring the fact that he was elected on his merits. If his election comes to be seen as the last word in affirmative action, rather than a mandate to the government to stop hiding from problems, then the Obama adminstration will lose much of its authority. Maybe a lot of people voted for Obama because he’s black. (And maybe even more voted against him for the same reason – that would be my guess.) But he was elected because he demonstrated himself to be able to comprehend, and tough enough to act. The election itself depressed me, because it demonstrated again how unpopular intelligence is in politics.Â Obama was attacked because he’s a good speaker and able to reason through difficult questions without needing a teleprompter. He was portrayed as an intellectual elitist (the first always implying the second) and not a man of the people.Â He refused to play the bumpkin, and was attacked for it, but the people, amazingly, decided that this time we should choose a smart guy over a plumber. Though it took an economic collapse to demonstrate just how much we need the smart guy. I don’t want to see that derailed. I don’t want Obama’s victory over prejudice to be solely over racial prejudice. I want it to be seen to be over anti-intellectual prejudice, and I want the executive to be seen to be as capable as it certainly is.